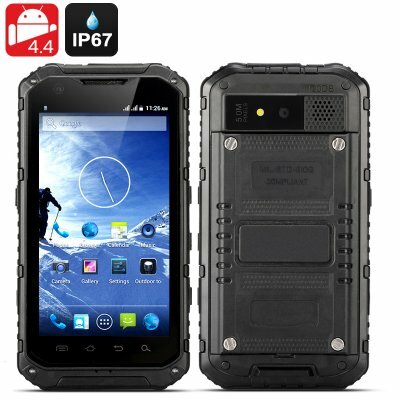 Successfully Added Android 4.4 Rugged Smartphone 'Ox II' - Quad Core CPU, IP67 Waterproof + Dust Proof Rating, OTG, 3000mAh Battery (Black) to your Shopping Cart. This Android 4.4 Rugged Smartphone boasts a Quad Core CPU, an IP68 Waterproof and Dust Proof Rating as well as OTG support plus a 3000mAh Battery. Just the thing for the outdoor enthusiast or for people that work outside, this Android 4.4 phone known as the ‘Ox II’ has an exceptional 3000mAh battery that provides up to 150 hours in standby mode as well as 5 to 8 hours of talk time. 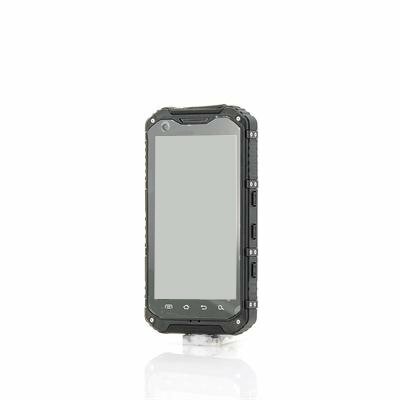 With a simple to grip rubberized exterior and tested to an IP67 waterproof and dust proof rating by our in house quality control, this shockproof phone will stand up to everything you or the environment can throw at it so you never have to worry about it getting wet or being dropped. The MTK6582 quad core CPU can reach speeds of up to 1.3GHz is more than capable of running the latest apps plus it is paired with a dedicated Mali400MP GPU and 1GB of RAM. Keeping in touch while out with the ability to update your status and communicate with your friends wherever your adventures take you is another great feature about this phone. Having both a 0.3 front and 8 megapixel rear cameras that are capable of capturing high quality pictures and videos ensures you won’t miss those precious outdoor moments. With this phone being OTG compliant it makes connecting external hardware even easier so you can use a keyboard or even a mouse. Boasting 8GB of internal memory and the option to add an extra 32GB via the micro SD card slot, you will never run out of storage space when using the ‘Ox II’ rugged smartphone. Please take note that the phone’s molding may mention IP68, however our in-house testing discovered this phone is actually IP67.